Gathering friends and family together to share a meal is one of life’s true pleasures. Often, though, the pressure of having everything just so diminishes that joy. If you’ve ever been to a party where the host has been flitting here and there in a frazzled state, you’ll know that being the host with the most is meaningless if you can’t stop and enjoy your guests. Nobody wants to feel as though they’re a burden on their host or sense any frenetic tension in the air. The point is, always, to have a good time. So, if you’re hosting this Easter, even if you’ve left the cooking to us (well played! ), here are our tips for a harmonious, enjoyable event. And because sometimes a drink goes quite a way to relaxing everyone, we’ve included some easy jug recipes, too. When deciding who to invite for your event, it always pays to ensure your guests have something in common. But spice things up with a wild card guest or couple, who are interesting and unexpected. Sometimes you need a live wire to get ignite the energy and get people mingling. Just keep the numbers small to ensure you can circulate around to all your guests. Afterall, grace is about making time for everyone. When you go out to a nice restaurant for dinner, you look for the little details in the service that make the hospitality feel genuine. It’s the same at your own home. As host, it’s your job to create a feeling of welcome for your guests. It’s as simple as offering a drink on arrival, styling your home with fresh blooms, or hiring a heater or bringing out rugs when it’s chilly. Guests don’t want to see their hosts folding napkins and polishing cutlery, it makes them feel uncomfortable. And, as host, you don’t want to be leaving your guests to their own devices while you buzz about setting the table. Make sure everything is in place before the first arrival. Use a mixture of textiles in unifying tones and scented candles or flowers to bring warmth to the table. Placecards are a nice touch if you have a crowd that don’t already know each other and might be nervous about choosing where to sit. Nothing exacerbates the awkwardness of stilted conversation like the absence of music. The right tunes help guests relax and fills in any natural silences. Just make sure to choose music that fits the mood of your party. Be prepared with a few different playlists that you can alternate throughout the night. A good trick is to have a wind-down one for when it’s time to wrap things up. As host, it’s your job to set your guests up with their first drink, but they shouldn’t have to rely on you every time their glass is empty. Create a nicely styled watering station with ice buckets filled with drinks where people can top themselves up as needed. It’s a nice idea to include a few premixed cocktails in jugs as a delicious alternative to wine and beer, see our recipes below. Being a great host really is about minimising stress on yourself so you can be there for your guests. A little commonsense goes a long way in achieving this goal. For example, never try a new recipe for the party – recipe fails don’t make for a relaxed host. And make life easy on yourself by outsourcing dessert to a professional, be it a beautiful cake from your favourite bakery (or Katering at Home), or a tub of artisanal ice-cream. You might think you’re just getting ahead of the clean up, but whatever you do, do not wash up while your guests are still enjoying themselves. Nothing makes people feel more like they’re being pushed out the door than a host who excuses themselves to wash dishes. If you find the stress of mounting dishes unbearable, and if you can afford it, hire the help of a young neighbour or family friend to clear tables and wash up for you. To make the honey and cinnamon syrup, place the honey, water and cinnamon in a small saucepan over low heat and stir to combine. Simmer for 10 minutes, remove from heat and allow to cool completely. Remove the cinnamon sticks and set aside. To make the cocktail, combine the vodka, ginger liqueur, lemon juice, pear juice, and the honey and cinnamon syrup, and vanilla extract in a large jug. Stir to combine and refrigerate until ready to serve. To serve, fill a large jug with ice and the chilled cocktail mixture. Top with soda water and sparkling wine and stir gently. Garnish with pear slices, cinnamon sticks, and mint to serve. Tip: You can make the cocktail the day before and store in the fridge. Simply give the mixture a good stir before adding the ice, soda water, sparkling wine and garnishes. To make the plum puree, place the plum, sugar, ginger, and lemon juice in a medium saucepan over medium heat. Cover and cook, stirring occasionally, for 5 minutes or until plums release their juices. Remove lid and cook for a further 6-8 minutes or until the plums soften and start to fall apart. Allow to plum cool slightly. Transfer to a blender or food processor and blend until a smooth puree forms. Set aside to cool. To make the cocktail, place 600g of the plum puree into a large jug, fill with ice and top with gin. Stir to combine and top with soda, thinly sliced plum, lime slices and mint to serve. Flowers are lovely, but they can’t feed you. We have many regulars at Katering at Home whom we speak to weekly. We love to delight them with menu items we know they’ll enjoy and it’s our pleasure to tailor their delivery specifically to their needs. From busy families and hardworking couples to those who simply loathe cooking, we take pride in making sure everyone is well fed and feels looked after. We humans often show our love and support by feeding others. How often have you dispensed a reassuring embrace with the phrase: ‘have you eaten?’. Or fretted over a loved one’s less than ideal eating habits? No doubt you’ve offered a sweet treat as a pick-me-up when a good friend dropped their bundle in front of you. It’s in our nature to nurture with the one thing we know will not only sustain us, but which also has the power to bring happiness, even if it’s momentary. At Katering at Home, you’ll often hear us say we’re here to help. But it’s not simply a line; it’s one of the true joys of our business. We offer our clients a uniquely bespoke service in helping them express their love and give support to those who they care for deeply with a box of meals and a hand-written note. Over the years we’ve put together and delivered hundreds of care packages, sent by our clients to people who need a little extra hand. Sadly, it’s often the case that these packages are given to those in unenviable circumstances for whom meal planning is considerably low on the list of priorities. At other times, our gifted deliveries celebrate the wonderful chaos of a newborn baby and the ensuing lack of time to cook, dress, and shower. And some people prefer to gift a credit for meals alongside a bunch of flowers, be it for a birthday or just because. There are also a handful of lovely clients who organise the weekly meals on behalf of their treasured but ageing parents. Obviously, working with food as the Katering at Home team does, we are natural born feeders. But each and every one of us understands the healing power of a beautifully prepared, wholesome meal. From our mum’s Bolognese to a bowl of a friend’s restorative chicken soup offered alongside a shoulder to cry on, we’ve all experienced food’s power to soothe an aching heart and stitch together a torn soul. To be able to help our customers offer such grounding, life-altering comfort is an honour for our team. So should you need to send delicious provisions to nurture or celebrate, give us a call. We are here to help you, help yours. Last week, Kate and the team thoroughly enjoyed styling and catering the launch of a stunning new Meriton development in Dee Why called Lighthouse. With the event being held on the Northern Beaches and with the building echoing a cool Hamptons-esque vibe, we decided to make good use of beautiful fresh seafood and lovely late-summer produce. But it won’t be long before our menus begin to take on a more autumnal tone. We’re slowly but surely sliding into the cooler months. The memory of summer is slipping a little further away with every day that dips below 30-degrees. Green leaves are quietly turning to rusty-brown and stone fruit and berries are dwindling in our shopping baskets. Our thoughts are turning to restorative soups, sour pickled plums, robust pulses and slowly braised meats. But, if you know what to look for, summer has left a few little gifts in her wake. You might be surprised to learn that mushrooms are beautiful at this time of year, especially king brown and field mushrooms. In fact, we’re so excited about these spongy, pudgy little earth-dwellers that we’re creating a mushroom bar for an upcoming event. There’ll be mushroom gnocchi, shiitake dumplings, mushrooms stuffed with quinoa, and a fantastic truffle mushroom cappuccino. And while peaches and nectarines are winding down, late-summer, early-autumn plums are sweet and plump. There are few things more delightful than a perfectly ripe plum. Most people seem to miss the season entirely, grabbing them too early when they’re still tart, giving this crimson gem a bad wrap. But if you catch them now while their skin is deep purple and they’re ever so soft to the touch, you’ll find yourself with a full-blown plum addiction. Which is exactly what we’ve developed here at Katering HQ. We’ve had to come up with a way to devour as many plums as possible before they disappear, so we created this gorgeous plum and apple crumble that makes use of the last plums and crisp, new season Granny Smith apples. In the interest of enabling your new addiction, we’ve shared the recipe, below. Preheat oven to 200C. Place the chopped plum, apple, sugar, cinnamon, orange zest and 100ml water in a large saucepan over medium-low heat. Cover and cook gently for 5 minutes or until apples are softened. Transfer to a shallow, medium ovenproof serving dish and set aside. To make the crumble, place the flour and salt in a bowl. Using your fingertips, rub in the chilled butter until the mixture resembles fine breadcrumbs. Mix in the oats, Demerara sugar and almonds. Scatter the crumble over the fruit in large chunks. Bake for 30 minutes or until crumble is golden. Serve with fresh vanilla ice-cream or cream. It may sound simple, but one of the best gifts we can give our children is knowledge around food. From where food comes from to how it can nourish your body and how to prepare it, this education is truly profound. Cooking is a life skill that will set kids up for health and happiness. It will enable them to appreciate the quality of what they eat, as well as the abundance of food they’re lucky enough to have on-hand in Australia. Visiting farmers markets and produce regions with your family is a beautiful way to open them up to this world. Another way is to cook with them at home. You don’t need to turn them into mini MasterChef contestants – a brûlée torch in the hand of a seven-year-old probably isn’t a good idea. But following a few simple recipes together, of the type of food they enjoy to eat, is a good start to setting up these foundations. You might even win a few battles at the dinner table if your broccoli-adverse child has tossed their most-loathed vegetable through pasta themselves. At the very least, they’ll have a greater appreciation of what’s on their plate. It’s a good move to start their cooking repertoire off on a sweet note. We’ve created a recipe for delicious apricot muesli balls and peach fruit leather (see recipes, below) for you to make at home. What we love about these little bites is they solve both the lunchbox and the hurried breakfast-while-running-out-the-door issues. Win! And because we’re all about making mealtimes easy and delicious here at Katering at Home, we’ve helped solve the ongoing lunchbox dilemma with our weekly menu that includes Vegemite scrolls, pizza scrolls, and our ever-popular banana loaf. When the weekend rolls around, bundle the kids into the kitchen to prepare our pre-mixed pancakes for breakfast. They can get creative with toppings and have a go at flipping the pancakes in the pan – supervised, of course. Or let them bake our cookie dough and watch their sense of self-accomplishment rise with the cookies. You never know, they might enjoy it all so much they give you a night or two off from cooking (one can dream). For the other nights, there’s always us! Place muesli, apricots, dates, honey and melted butter in a food processer. Process for 2-3 minutes or until well combined. Add pepitas and sunflower seeds and stir to combine. Place coconut in a shallow dish. Roll tablespoonfuls of mixture into balls. Roll balls in the coconut to coat. Store balls in a sealed plastic container in the fridge for up to 2 weeks. Preheat oven to 80–100C (or set to the lowest temperature). Line a baking tray with a non-stick silicon mat or baking paper. Using a hand-held blender or a food processor, blend peaches and honey until smooth. Using a spatula, spread mixture evenly over the baking tray. Place in the oven for 2–3 hours (or overnight if you have a very low setting), or until mixture is set and dry. 6. Allow to cool slightly, remove mat or baking-paper and place on cutting board. While leather is still on mat, cut into strips using a pizza cutter or very sharp knife. 7. Place leather on strips of non-stick baking paper before rolling. Store in an airtight container for up to three days. If your year hasn’t quite kicked off with as much momentum as you’d like, then may we suggest a do-over? Yep, it’s time to embrace the Chinese calendar and restart 2019 with Chinese New Year! Celebrations to usher in the New Year kick off about now, a week before the 2019 Year of the Pig ticks over on 5 February. Which means there are plenty of opportunities to flex your chopsticks and shovel in as many dumplings as possible. Sure, the enjoyment of dumplings isn’t confined to Chinese New Year, but any excuse to devour even more of those pillowy parcels is wholeheartedly welcomed by us. This year, it’s all about the pig. The prosperous chubby jowled pig is not only a delicious animal, but also the twelfth sign in the Chinese zodiac. According to mythology, when the Jade Emperor was deciding the order of the zodiac, the pig overslept and arrived last, taking twelfth place. But don’t worry, it’s not all sleep-ins and bacon, the pig is a sign of wealth in Chinese culture and those born in the year of the pig are said to be realistic, hardworking and enthusiastic. Well done, you. Whether you’re a pig, dog or snake, Chinese New Year is loads of fun. The City of Sydney puts on a great Lunar New Year party every year, so check out some of the events and, if it’s been a while since you’ve ventured down to Chinatown, now is the best time to visit for a pork bun and a custard tart. Chinese New Year also provides an excellent excuse for a dumpling dinner party at home with family and friends. But as New Year falls on a Tuesday just as school goes back, you may not feel so inclined to spend hours in the kitchen perfecting your dumpling folding technique. Don’t worry, though, because we have. All you need to worry about is dusting off that rice cooker. Our nimble-fingered chefs have been busy crimping little squares of pastry filled with pork and ginger, chicken and water chestnut, Peking duck, chicken and shiitake, and tofu and spinach, as well as prepping other classic meals such as duck pancakes and Hainanese chicken. For the full menu, click here. Whip out your bamboo steamers and get ready to celebrate! From all of us here at Katering at Home, kung hei fat choi! Christmas testing and production is now in full swing and Katering at Home is humming along like a well-oiled machine. Each morning I step into a bustling hive of activity, music blaring, chefs chopping, computers tapping away…. For many, like myself that work and have worked for Katering, this place is like a second home. Children are very much part of many of our lives and therefore become a solid fixture in much of our working lives. They often test our recipes (and our patience) and provide endless inspiration and ideas. As part of our Bakery and Christmas range we wanted to provide a bake-at-home hands on product, sort of a family affair really. Something to keep kids entertained during the holiday period and something fun parents or grandparents could be part of and so the Gingerbread kit was born. Our mixture is nut-free, contains no food colours, preservatives or additives. They are available online from next week and have been sold through our Christmas markets. If you have purchased the kit you’ll need the following few fresh ingredients to get the ball rolling. Mix the butter and golden syrup for a few minutes by hand until glossy and well combined. Tip in the contents of your Gingerbread jar, get little hands dirty and mix until the mixture forms a breadcrumb like consistency. Make a small well in the centre and pour in cold water. I’ve used soda water as that’s what I found in the fridge, either is fine. Now it’s time to bring the mix together, tip onto the bench and mix till just combined and the mixture forms a soft ball in your hands. Wrap in plastic and rest for 30 minutes in the fridge to firm up. When you’re ready to start rolling just throw a little flour onto the bench and roll the pastry out slowly to around 5 mm thick. Cut out your gingerbread shapes and lay onto a tray lined with baking paper. You can scrunch up the off cuts of pastry and re-roll them a few times over. You should end up with about 10 large gingerbread men in the end. Bake in a pre-heated 160c oven for around 15min. or until just coloured then rest until cool on a wire rack. From there it’s totally up to you. Dust with a little icing sugar and enjoy with a cuppa or get creative with fondant, sprinkles and food colour and bring your little men to life. We finished ours with a little white icing and a few sprinkles I rescued from the back of the pantry. The dough will keep in the fridge for a week or freeze for 3 months. Now I know it’s a little ironic for a food home delivery service to be telling you how to cook! But my plan is to impart a few tips and tricks that will make creating and assembling your Katering at Home meals just that little bit easier, quicker and so much more rewarding! Below are the 9 top tips from the Katering at Home team. Safe defrosting is the most vital thing you can do with any of our Katering at home frozen meals. One of the safest ways to do so is in the fridge overnight/day. This is what we recommend on all our labels, however, this does require pre-planning and some of us just don’t know what we want to eat the following night for dinner. Typically for all katering at Home curries, soups and sauces our packaging will defrost in a sink of cold water for a few hours. The last option is the microwave, but this can be uneven and semi cook the food making it tough and rubbery. One of my biggest bug bares in the kitchen is waiting for a pot of water to boil! Arhh I’m so impatient! Then I was told by a chef about this nifty trick. Pop an inch of water into your pot and get it going full heat, then boil your kettle and add that boiled water to your pot and viola, boiling water in under 3 minutes! When we have fresh pappardelle pasta on the menu I always have the sauce hot and ready to go and no pasta cooked. I always end up over cooking the sauce, this trick will save your sauce, time and emotional strain! It’s important to make sure your oven tray or roasting pan is tailored to its contents. The ideal oven tray or pan is heavy enough not to warp but not so heavy that it can be dropped when it’s full and hot. Here are some things to consider. Depth can affect roasting time. Too deep a tray prevents the oven’s hot air from circulating beneath the product, too shallow could let those precious juices slosh out. The ideal depth for a roast is approximately 5–8cm as this will give you good air circulation. For roasting products such as fish, croquettes, pizza or small cut’s of meat a shallow oven tray is essential. The quickest way to drain your confidence is with an over-cooked or charred dinner — often a result of a hot or temperamental oven. With Christmas steadily approaching it’s time to make sure your oven working efficiently. If you suspect your oven has hot spots or bakes inconsistently we suggests buying an oven thermometer to measure the degrees on different shelves or sides of the oven. Position the thermometer in the center of the oven so it’s visible through the window, and heat the oven to 180°c. When you have four readings,calculate their average by adding and then dividing them by four. If the average is between 160°c and 190°c, the oven is calibrated. If it’s outside that range, the oven needs adjustment. In this case, consult the owner’s manual. Calibrating some ovens is as simple as turning a screw, but for others, you may have to call a professional to do the job. Everyone favourite emergency ‘can’t be bothered’ cooking appliance. From microwave popcorn, steamed vegetables to reheating a delicious soup or main delivered to you by Katering at Home, the humble microwave does it all! Most of our products will have a range of heating instructions on the label with how to heat and best serve. Most homes have one and I love the way this butler’s pantry is organised with easy access to the microwave, especially for the littlest of family members to help out with the cooking. 7. Mixing bowls – size counts! All of our dishes come to you seasoned by our professional chefs, we tend to go light on the seasoning with children in mind but If you are anything like the great Nigella Lawson seasoning is always essential. She carries extra salt pepper and mustard in her handbag at all times! A dash of salt, or drizzle of good extra virgin olive oil to any dish can really help make the flavours sing. One of my favourite go-to’s is a squeeze of lemon, I add it to everything and I just love the tangy feeling paired with the warm savoury, Yum! This is something my mother taught me and now it is just habit. Washing up as you go will save you so much time and hassle at the end of a meal. If you can fill a big sink with water you can just drop things in as you cook. And be sure to enlist a small person or child to help. Don’t forget Katering at Home orders close at 8pm on Thursday night! Don’t be late or you will miss out! My mother made sure that we set the dinner table correctly for dinner every night in our house. It was a skill I have come to appreciate as an adult but also a ritual I enjoyed as a child. Surprisingly my brother and I didn’t mind this daily chore! I have the pleasure of working directly across from our Senior Event and Wedding coordinator, oh and the owner of Katering Kate white! She has helped me create this blog that only scratches the surface of dinner settings and meal sharing, you will hear her thoughts, tips and tricks throughout this piece. The basic formal dinner table place setting is below, it is a tad more formal then your usual week night dinner, but it is a skill every entertainer should embrace. When dining as a guest it is important use your utensils from outside in finishing with dessert at the top. The same goes for plates. Start at the top and work your way down. Especially when sharing a meal and multiple courses using one plate at a time will save your dear host that extra plate to wash up between courses or at the end of a long night. Candles and flowers are always a great addition to any dinner party table, our Katering events team use flowers and candles wherever they can to create a mood and intimacy for guests. When sharing meals with friends and family it is important to decorate but also to use your space wisely. You will have large platters of food being passed around and they are going to need a place to sit once everyone has had a taste. I suggest that when you set the table have items that are easily removed when service starts. So, flowers in small vases and centre pieces that can be put on the side board while the guest marvel and devour the delicious meal you have presented. I would encourage you to keep candles on the table, taking them away might leave a light gap in the middle of the room just shuffle them around on the table to have ambient light and no burnt hands reaching over! Now the table is set it’s all about the food and how you present it. Protein or main element of the meal should be presented centre stage of the table. Although if you have a large table to feed it is good to split this onto two plates so that each end of the table will get to try and enjoy the full experience paltered up beautifully as well as not missing out on the choice selection. The supporting choir or back up dancers are your side dishes and all the bits and pieces that make your dinner a complete and interesting meal, these can be piled high into bowls or delicately scattered around on smaller sized plates that are easier to manage. When laying out all the food to share it is a good idea to keep it along the middle of the table not just for ease of passing but everyone’s eyes will be focused on the food and the abundance of food. This creates an atmosphere of a grand feast and who doesn’t love a long feast with family and friends! Now that you are inspired to host your next dinner party, and maybe slightly stressed at all the work involved in such undertaking. Why not let Katering at Home help you out? We can handle it all! From the hero roast chicken, to the crunchy salad and saucy side dishes it can all be ordered via Katering at Homes Weekly Wenu and Family Favourite menu. We even have dessert covered with a classic apple pie or pull apart cinnamon rolls. 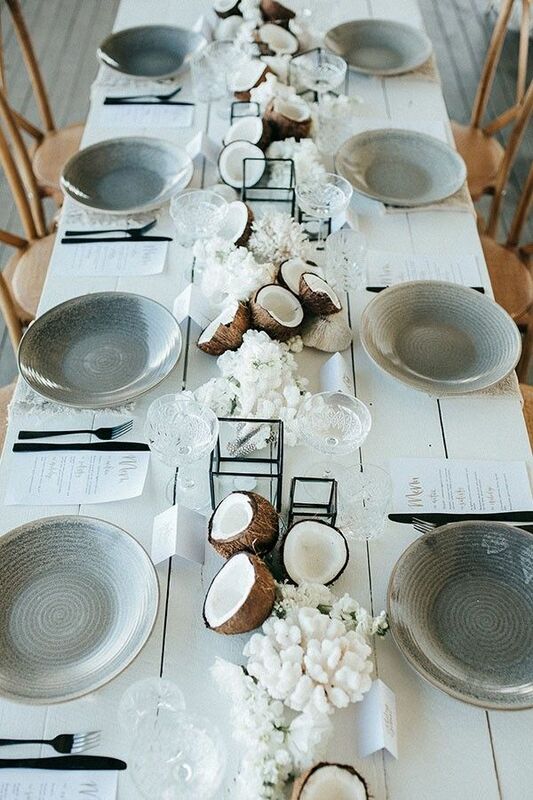 All you need to do is set the table and invite the guests. Simple! Or maybe you are so inspired that you want to host a large diner party and it’s still a bit too much even with Katering at Home’s help! Give us a call on 9319 2700 and our event team will happily assist in bringing your ideas to life, they will even set the table! On the menu this week Katering at home has a side dish of zoodles, or rather “zucchini noodles.” Our chefs are making a delicious zoodle salad with whipped ricotta, toasted pine nuts, garden peas, mint and zesty lemon vinaigrette. This will come as a refreshing side dish to our Turkish chicken skewers that are found on the Weekly Menu. Spiralized vegetables have been around for a while now, because they are a fantastic way to add extra veggie into any meal. Packed with vitamins and minerals, low in carbs and starch and tons of flavour! Don’t feel restricted to just zucchini though, you can spiralize carrot, parsnip, cucumber, broccoli stem, cauliflower stem, beetroot, and sweet potato. Now that you know you can use nearly any vegetable your heart or dish desires, its time to create some delicious food! First off, I would suggest investing in a vegetable spiralizer, you can pick one up in your grocery shopping for as little at $10 or a top of the range $150 automatic spiralizer. I have a little $10 one and it works a treat with a little bit of elbow grease. Just pile up your noodles in a microwave safe bowl and a tablespoon of water in the base and cook in 30 sec increments tossing in between. Cook for 30 second at a time until cooked to your desired texture. I would recommend 1-2 minutes maximum of cooking. This technique is great If you are already cooking on your stove top, just toss noodles in a table spoon of olive oil and fry for a minute or two on a high temperature. Boil a pot of water, once your water is at a nice rolling boil drop in your noodles for one minute, strain the noodles and serve. If you like your noodles a bit drier just pat them down with paper towel before serving. All of these methods and cooking times will depend on the type of vegetable you use. Sweet potato will take longer to cook then your Zucchini but just use your senses to judge the right consistency for your meal. I always air on the side of under-cooked as the veg will continue to cook once removed from your bowl, pan or pot due to the residual heat within the vegetable mass. If you have any questions you would like answered or suggestions of what you want to see on the blog next let me know via email, Instagram or Facebook. Also, we are running a competition to win a $200 gift voucher so head over to our Instagram pages and comment on the win photo to enter. A cool season favourite, cauliflower is one of the most versatile and delicious brassica Winter vegetables. All kinds of unique cauliflower varieties are popping up in local farms and community markets and they are all so gorgeous and unique. I can’t go past the astonishing natural structure of the Romanesco cauliflower, such a stand out vegetable! Purple and green are also in season and these fun variations all cook the same, so no need to fuss with the recipe just, marvel at their incredible taste and colour! Here at Katering at Home our teams main focus is as always, fresh, local, seasonal produce in all our dishes; keeping them full of flavour and at their nutritional peak and for me cauliflower ticks all the boxes. It’s high in vitamin A, C, D, B-6, B-12 and magnesium. One of the other great benefits of cauliflower and why it is so popular at the moment is that it is very low in carbs, one cup of raw cauliflower is only 5g of carbs! A simple and delicious way to have a hearty warm winters soup, smooth cream and super filling. Our chefs make the most delectable cauliflower salad! The cauliflower florets are roasted till smoky and sweet, salad is then finished with chickpeas, fresh herbs and tahini yoghurt dressing. Have some trendy vegan friends coming over for Sunday lunch? Why not try and roast a whole cauliflower head as your ‘protein main’. Spice it up with some garlic, paprika and lemon or thyme, parmesan and lemon. Instead of having your traditional carb-y side dishes such as rice or mash potato, use cauliflower instead. Just whizz some raw cauliflower up in the food processor until it reaches a rice size texture. Alternatively boil and mash just the same as you would with a potato for mash. A great way to get some extra veg into the kid’s diets, try your hand at cauliflower ‘nuggets’. Simply boil your cauliflower until tender, let cool and roughly chop. Then add your binding ingredients in the way of flour and egg. Now time for the flavour, garlic, parmesan, parsley, salt and pepper, whatever combinations your heart desires! A much healthier alternative to your Friday night take away pizza. Aging like most of the above ideas whizz your cauliflower up finely in a food processor, bind with egg and parmesan and thyme. Form your mix into a pizza base and bake in to oven until lightly golden (210c). Take your pizza out and top with sauce and toppings. Cook for 5-10 more minutes and serve! Yum! Finally, a super heathy and delicious movie snack. This one takes a bit more time in cooking and preparation but is totally worth the extra effort. I hope you have enjoyed this little post about all the great thing you can do with the humble cauliflower. Keep your eyes peeled for more post coming. If you have any questions or topic ideas you would love to see leave a comment below or head on over to our Instagram page @kateringathome and send me a DM. The prospect of creating an edible vegetable garden can be all-consuming for most people, it’s easy to get over excited. Spurred by the overwhelming urge to become a wild goddess, you find yourself up at all hours, glass of wine in hand designing your mini oasis. You may have good intentions but for the time poor, possibly a misguided effort? My advice? Start off small, if you have young children, get them involved, it’s not hard to get started and it doesn’t take much effort. If your limited with space, why not join one of the many Community garden projects or start by planting a mini herb garden. You’ll save loads of money and you will be rewarded with a generous crop in no time at all. Creating a simple herb garden is easy…. Dig around in your recycle box and pull out some tins. Whatever you have is fine, big or small. Wash and sand back any sharp edges. Get a nail and punch a hole in the bottom for drainage. Fill the cans with seed raising mix and press down lightly to compact the soil. Sow seeds or seedlings such as basil, thyme, chilli, parsley, mint or any other herb you like to use regularly in the kitchen and water in well. Keep in a shaded area until they settle in then move to a partly sunny window sill or kitchen area. Within a month you’ll be making pesto till the cows come home. If you end up with a bumper crop just cut your herbs 5 cm from the base and tie with string and hang upside down to dry. Drying herbs has the benefit of making the kitchen smell lovely and can be utilised for months to come in soups, pizza, teas and stews. Last year my bumper spearmint crop kept the whole office busy brewing delicious tea for months. This year my basil seems the happiest so the family seem to be eating pesto with everything, pesto pasta, pesto mayonnaise, pesto butter, chilli pesto, you name it! As my grandmother would say, there’s are certain satisfaction and reward in growing your own produce, be it a few herbs or a whole vegetable patch, gardening can certainly be soothing to the soul and a truly rewarding for the heart. This Friday (February 16th) is Chinese New Year, variously known as the Spring Festival or the Lunar New year. Chinese New Year is centuries old and is the most significant holiday in China. The city streets fill with festivals, arts, entertainment, markets, dancing and fireworks spectacles. Chinese New Year celebrations encompass a vibrant and energetic display of colour, culture and tradition. What better way to partake in the joy of Chinese New Year than with our divine Chinese braised pork bao buns A soft, pillowy steamed sleeping bag of bun encasing salty and sticky braised and pork belly, pickled carrot, cucumber, shallot, coriander and sweet Hoisin. New to the weekly menu and available this week only, be sure you don’t miss out! We also have a delightful new addition to our Family Favourites menu for this month only. Delicious chicken and vegetable dumplings. These ‘pot stickers’ are a most important Chinese New Year food as they are symbolic of both plenty and new beginnings for the coming year. As perfect snack to fill hungry teenagers, cook them straight from frozen and enjoy. Little fingers will love them too, with dinner sorted in 10 minutes you can take back some time for yourself. If you plan on celebrating, why not take the opportunity to gather some friends and have a giggle re-creating our recipe for Super Stretchy Chinese Noodles. A real treat to make and lots of fun. Noodles are one of the most important components of Chinese food culture. No matter whether ordering a hot bowl of noodles in a restaurant or purchasing freshly made noodles to cook at home, it’s one of the cheapest ways to have a fast, fulfilling and hearty feast. Careful not to break them! Unbroken noodles represent a long life, and some say it’s even bad luck to cut them! 280ml water at room temperature. Dust a bowl with dry flour. Transfer the dough to that bowl and cover with a damp cloth. Let rest at room temperature for a least 2 hours. Cover each piece with plastic and let rest for 1 hour. Pick each strip up at one end and pull to form a very long noodle, drop into the water quickly and repeat with a quarter of the noodles. It’s back to the grind for many of us this month. No doubt we have all dabbled with a few thoughts involving fitness, heath and relaxation for the new year. Unfortunately with work expectations, children or social life, too quickly these new year’s resolutions can fall by the wayside. To keep you inspired I’ve compiled a few tips to keep motivation on track for 2018. Keeping meals simple, fresh, seasonal and easy is always the best way to work in the kitchen. For most home cooks, simplicity is the best advice I can give. Keep cooking simple during the week then invest your time creating that culinary masterpiece on the weekend when you can relax and enjoy the process. It can be a real chore to get meals on the table during the week, at Katering at Home we endeavour to bridge the gap with a selection of healthy, filling and delicious meals to get you through the better part of the mid-week rush. Back yourself up with a few Pantry items to jazz up your salads and pop some Family Favourites in the freezer so you’re never left in the lurch. Here at Katering we believe in moderation, we don’t pretend to be anything we are not. We don’t focus on foods for fitness or fancy diets. What we do it well, is to design, test and cook fresh, quality meals with honesty. Food full of flavour, full of colour and texture, meals packed with grains, legumes, colourful fruits and vegetables, ethically raised meats and market seafood so that you can stop worrying and start enjoying a selection of great food. Heaven knows there’s enough to worry about already! You don’t have to run a marathon to be fit, fitness starts by getting active. Even just brisk walk each day for 20 minutes can get your heart rate up and boost metabolism. An active body improves brain power and concentration, making you feel better and can start you on your way to a healthier lifestyle. When you relax, you give yourself permission to let go of worries for a while. Relaxation gives your mind and body time to recover from the stresses of everyday life. Try to fit things into your day that help you unwind. It’s different for everyone. For you, it might be listening to music, going for a walk, tea with friends, yoga, a few laps at the local pool. Find something that you enjoy and make a conscious effort to do that relaxing thing every day. In a busy work day, even 10 minutes of downtime can help you manage stress better and feel better inside and out. Lastly, why not treat yourself now and then? A relaxing massage, a new book to read, whatever makes you happy really. There are many healthy desserts you can easily make at home for a special treat that won’t add to the pocket or waistline. You are more likely to stick to your goals if you cut yourself a little slack now and then. Peaches are not only delicious but incredibly nutritious. Give my Peach, Watermelon and Vodka Granita a whirl this weekend and treat yourself. Full of antioxidants, vitamin A & C, potassium, low in saturated fat and high in dietary fibre. I can’t say much for the vodka but hey, one has to live a little, right? Wash the peaches and place small cuts in the top and bottom, this will help to release the skin when the they poach. Place the water, sugar and the scraped vanilla bean into the pot and bring to the boil. Place the peaches into a pot with just simmering sugar syrup. Cover with some baking paper and an upside-down plate and allow to simmer very gently until the peaches are just soft. Once soft, peel the skin off, cool, blend and strain the flesh of the peaches with the mint and watermelon. strain this mixture through a very fine sieve. Stir in the vodka and lime juice then pour into a flat tray in the freezer. Stir gently after a few hours then leave overnight. For a child friendly version omit the vodka and add 1 cup of the poaching liquid to your base mixture. Once the granita has been scraped add a little Greek yoghurt and some crunchy flaked almonds when you serve. Preheat the oven to 180c (160c fan-forced). Grease and flour a 20cm x 30cm pan, line the base with baking paper. Beat the eggs in a small bowl with an electric mixer until light and fluffy. Gradually add the sugar, beat for about 8 minutes or until the mixture is thick. The mixture should form thick ribbons when the beaters are lifted. Meanwhile sift the flour and cornflour together three times. Combine the butter and boiling water in a small heatproof bowl. Transfer the egg mixture into a large bowl. Sift the flour mixture over the egg mixture; using a whisk or a large metal spoon, gently fold, then fold in the butter mixture. Pour into the prepared pan. Bake in a moderate oven for 25 minutes or until the sponge springs back when touched lightly in the centre and comes away from the pan. Turn onto a cake rack to cool. Cut the cake into 20 even pieces. Meanwhile, sift the icing sugar and cocoa into a large heatproof bowl; add the butter and milk; stir over a medium saucepan of simmering water until icing is smooth and thick enough to coat the back of a spoon. Pace the coconut into a bowl. If you plan on celebrating the Australia Day long weekend festivities with the inclusion of a few baked treats (and so you should because any excuse will do really) then it’s time to dig out the Mixmaster, and your best frilly apron this weekend. We are all pretty proud of our Aussie desserts – Pavlova, Anzac bikkies, fairy bread and of course, the classic lamington sponge, possibly one of our most favourite iconic treats. Like many my age, I have been blessed with fond childhood memories of the delicious, coconut and chocolatey treat that is the lamington cake. My family, with two young boys in tow, were avid participants in the local Scouts club. Every other weekend quickly became a regular social and community affair. Each year around Australia Day all the mothers and volunteers would gather round with their colourful aprons on, producing hundreds and hundreds of lamingtons to be sold at the local Scout fete for charity. I was young but had already developed an insatiable drive and enthusiasm to get my hands dirty in the kitchen and what better way than having the opportunity to dip them into the gooey, sticky mess that is the humble lamington. Often, I’d be found hiding under the table while ladies busied themselves chatting, gobbling down any of the defunct, fluffy sweet morsels with sheer delight. I have memories of community and togetherness….. for me and many others, the humble lamington is truly embedded into my Australian heritage. Subsequently, 20 years later, most of which time was spent in the kitchen as a professional pastry chef, I’ve not had the opportunity to make many of these little gems. Yet they are certainly imprinted in my reflective childhood memories with the likes of rock-cakes, (strange things that they were) lemonade scones and pikelets, which seem to be making a solid revival in my house these days with two children under five. I am sure you’ve noticed lately the lamington is a little bit on-trend, with tricked up shredded organic coconut, soft as a cloud gluten-free sponge, Swiss chocolate sauce and numerous fillings ranging from popcorn custard to Pina Colada, pandan and peppermint. As we celebrate Australia Day this week, I feel it only fitting we go back to our roots and start with a beautiful, fluffy and simple lamington; made the old fashioned way, perfect with an afternoon cuppa. Use this base recipe as a guide, keep them simple or jazz them up any way you like. Personally I’m a fan of the jam and cream filled variety but each to their own really. No matter how you have them, these little treats are a guaranteed crowd pleaser! So often great food goes to waste in the home kitchen and too often we at Katering are left with excess produce after a busy week. What better way to reduce food waste than to pickle, preserve, jam and jar. It’s creative, fun and delicious. There is certainly no reason why you can’t try it at home. Be careful though, it can be addictive! You can purchase a few select and super delicious pickles from Katering at Home , we produce an ever changing selection of pickles based on the season; our most popular being the Pickled Beetroot and Baby Onions but if you want to have a little fun in the kitchen why not spend this weekend getting pickled. Pickling is a cheap, easy and nutritious way of preserving the best of the winter vegetables. It’s also great for your gut too, packing in the Probiotics. Pickling is a form of fermentation, when vegetables and fruits are fermented, healthy bacteria help to break down the hard-to-digest cellulose in foods, as well as some of the natural sugar. That is the question. With all of their health benefits, it seems like pickles can definitely be beneficial when eaten in moderation. Pickling your own vegetables and fruits can help you preserve the produce in your home fridge, as well as bring new flavours to your food. So what are you waiting for? Grab a jar and get pickling! It’s easy to do. Below I have included a recipe for crispy quick refrigerator pickles and a good for the gut, fermented pickle….. So keep your old jam jars and give some new life to those sad forgotten vegetables at the bottom of your crisper. Prepare the vegetables by washing them and patting dry with paper towel, slice or quarter. Bring the water, vinegar, salt and sugar to the boil in a medium size pot. Let sit for a half hour to cool slightly. Divide the spices evenly between the jars. Layer the vegetables into the jars with the fresh herbs and garlic slices. Pour the hot liquid into the sterile jars, making sure to submerge all the vegetables. Cover with a lid and let cool on the bench. Slice the ends from the cucumbers and cut them in half if desired. You can also leave them whole if you prefer. Stuff the cucumbers so they fit snuggly in the jar and add fresh dill, chilli, dill seeds and pickling spice. Mix salt and water in a large measuring cup, stirring until the salt is completely dissolved. Pour over the cucumbers until they are completely submerged. Make sure to leave at least 2 cm of head space to allow the brine to bubble up during fermentation without exploding the jars on you. Alternatively, if you wanted to draw more flavour out of your spices, you could also do this is by heating the dill seeds, pickling spice, salt and water over medium heat until it comes to a simmer then let this brine come back to room temperature before adding it to the jar. Once the cucumbers are completely covered with the brine, place a small non-reactive object such as a small dipping bowl, shot glass or plastic lid over them to make sure they remain entirely submerged then close the lid leaving a little open to allow gas to escape. Leave your pickles to ferment on the bench for 7 to 10 days. Open the jars every day to allow gas to escape. After 7 to 10 days, transfer your pickles to the refrigerator, they will keep for 3-4 weeks. If you like your pickles to be a little more on the vinegary side, you can add a little bit of vinegar to the jar once the fermentation process is complete. Let your pickles macerate for a couple more days before eating them. Everyone loves a delicious melt in the mouth homemade pie or tart. Whether a classic zesty lemon meringue or a decedent rich chocolate tart, sweet shortcrust pastry is one of the simplest and quickest pastries to make. Shortcrust pastry (or pate sucree) is one of my favourites and works well with any sweet filling. It can be made ahead of time, frozen in blocks or lined and ready for baking, so why is everyone scared off and why so many fails in the kitchen? 1. Why is flour type important? If you want that classic delicate crust and crumby texture you need to use flour low in gluten. The general bulk of the problems we encounter with pastry preparation are solely because we overwork the pastry, therefore working the proteins strands through pressure and manipulation. To keep it simple, the best type of flour for the job is plain old white flour from the supermarket. In the commercial kitchen we call this ‘all-purpose flour’ if you can find ‘cake flour’ even better but it’s not essential. The one thing I must stress and repeat over and over again is to keep everything COLD. It’s a great idea to keep the flour in the fridge. Cold kitchens, cold work surfaces and cold equipment. Start your pastry first thing in the morning before the day warms up for best results. Always rest your dough for at least 30minutes after making it. This again helps the pastry to relax and remain short and crumbly. You will find the less you do to it the better it will be. I like to rest the pastry for another 30min after lining my tart base and before baking. A good 30min in the fridge or freezer will work wonders. We must treat our dough with care, be quick, be gentle and take care. Don’t overwork it, or warm it too much with your bands. Just be light and nimble fingered. Don’t stress out. Let the dough relax and relax and enjoy the process. Have a 20cm round tart tin ready to line, keep it chilled in the fridge if you prefer. Weigh up all the dry ingredients, place into a bowl in the fridge. Cut the butter into small dice (all the same size works best) and keep in the fridge. Using a folk stir in the egg and vanilla just until the pastry comes together. Pat into a small round flat disk, do not work the dough at all, and just bring it together gentry. Wrap in cling film and rest in the fridge for 30min or overnight. Roll out the pastry between two pieces of baking powder till 5mm thick. If the pastry becomes a little soft you can always place it in the fridge for 10min at this stage. Line the 20cm round tart tin, using flour to lightly push it into the corners and trim off any excess with a sharp knife. At this point if you have the time, rest the lined tart once more. If you don’t want to make your tart today just wrap and keep it in the freezer for up to a month. Place baking paper into the tin and pour in rice or beans. Par bake for 30min or until light and golden. Now you are ready to make, fill and bake your favourite tart! At this stage, if the bottom of your tart is still a little undercooked just take out the beans and bake for a further 10min. If you have a few cracks then make slurry with some leftover pastry and water and patch up and cracks or holes.